So an 18-year-old college freshman set out from his dorm room to track down Bill Gates, Lady Gaga, and dozens more of the world’s most successful people to uncover how they broke through and launched their careers. And how did he fund his journey? Well, he hacked The Price Is Right, won a sailboat, sold the sailboat, and then set off on his quest. 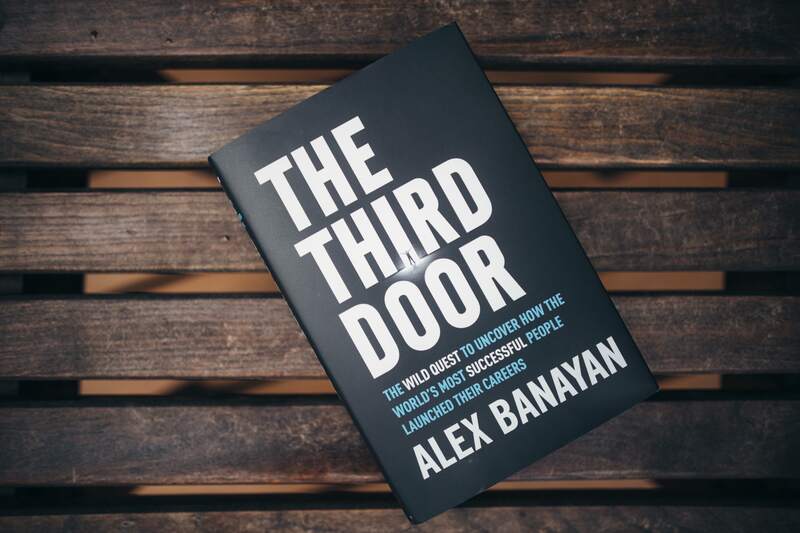 Alex Banayanis the author of the new book The Third Door, which chronicles his five-year journey tracking down Bill Gates, Lady Gaga, Warren Buffett, Maya Angelou, Steven Spielberg, and dozens more of the world’s most successful people to uncover how they broke through and launched their careers. From hacking Warren Buffett’s shareholders meeting to chasing Larry King through a grocery store to celebrating in a nightclub with Lady Gaga, The Third Dooris packed with adventures and Alex was kind enough to share an early copy. After reading it, I had a chance to ask Alex five of my most pressing questions about how this whole book came to be. CAROLINE: Writing a book is no easy task. How did you decide to take the leap and go all in on writing The Third Door? Alex: It was never part of the plan. I was a freshman in college and spending every day on my dorm room bed, staring up at the ceiling. I don’t know if you’ve ever gone through the What do I want to do with my life?crisis, but I was going through it and it was hitting me hard. To understand why, you have to know that I’m the son of Persian Jewish immigrants. I pretty much came out of the womb with “MD” stamped on my behind. By the time I got to college, I was the pre-med of pre-meds. But it wasn’t long before I found myself hitting snooze four or five times each morning—not because I was tired, but because I was bored. My question of “What do I want to do with my life?” eventually turned into “How did the people who did know what they wanted to do break through?” How did Bill Gates sell his first piece of software when nobody knew his name? How did Steven Spielberg, who’d been rejected from film school, become the youngest major studio director in Hollywood history? I went to the library and ripped through business books and biographies, searching for answers. But eventually I was left empty-handed. That’s when my naive eighteen-year-old thinking kicked in: Well, if no one has written the book I’m dreaming of reading, why not write it myself? And that’s what set me off on this seven-year quest to write The Third Door. CAROLINE: After all your research and interviews, how do you encourage people to think unconventionally about how to get things done? ALEX: My goal was never to find the “one key” to success. We’ve all seen those business books and TED Talks. I usually just roll my eyes. What I did discover, though, was that while every person I interviewed was completely different on the outside—at their core they approached life with the exact same mindset. Every single one of these entrepreneurs treats life, business, and success . . . like a nightclub. There’s the First Door: the main entrance, where the line curves around the block. That’s where 99 percent of people wait around, hoping to get in. There’s the Second Door: the VIP entrance, where the billionaires and celebrities slip through. But what no one tells you is that there is always, always. . . the Third Door. It’s the entrance where you jump out of line, run down the alley, bang on the door a hundred times, crack open the window, sneak through the kitchen—there’s always a way. Whether it’s how Bill Gates sold his first piece of software or how Steven Spielberg became the youngest studio director in Hollywood history, they all took . . . the Third Door. I’ve learned that this Third Door mindset has not only transformed the way I think about finding unconventional solutions to challenges—but it also has transformed the mindset of many, many others. CAROLINE: The people you interviewed are all successful but all have different backgrounds, have had different upbringings and for many have different motivations in life. What do you think they have in common that allowed them to all take the Third Door? And I believe all of the people I interviewed had that same burning desire that Sugar Ray talked about. CAROLINE: What was the most unexpected thing you learned from meeting with all the people you did? ALEX: There’s a pervasive myth in Silicon Valley of the superhuman entrepreneur. Someone like Elon Musk, who we assume must be fearless. But that couldn’t be farther from the truth. Every person I interviewed was actually tremendously scared. Fear is a natural part of entrepreneurship. So although no one I interviewed was fearless—they all were courageous. And there’s a critical difference. Fearlessness is jumping off a cliff without thinking. Courage, however, happens when you acknowledge your fear, analyze the consequences, and decide you’re still going to take one step forward anyway. CAROLINE: How has this book writing and interview process changed your outlook and the way you live your life? ALEX: Everyone has the power to make little choices that can alter their lives forever. You can either choose to give in to inertia and continue waiting in line for the First Door, or you can choose to jump out of line, run down the alley, and take the Third Door. We all have that choice. If there was one lesson I learned from my journey, it’s that making these choices was possible. It’s that mindset of possibility that transformed my life. Because when you change what you believe is possible, you change what becomes possible. CAROLINE: Thank you so much, Alex. If people love these stories and lessons as much as I do, order a copy of The Third Door: The Wild Quest to Uncover How the World’s Most Successful People,which is available everywhere today.